The Armed Services YMCA is thrilled to announce Aviation Survival Technician Third Class (AST3) Richard C. Hoefle as one of the 2018 Angel of the Battlefield award recipients! AST3 Hoefle will be honored on October 2, 2018 at the Angels of the Battlefield Awards Gala in Arlington, Virginia. The Angels of the Battlefield Awards Gala acknowledges medics, corpsmen, and pararescuemen for their life-saving medical treatment and trauma care on the battlefield. 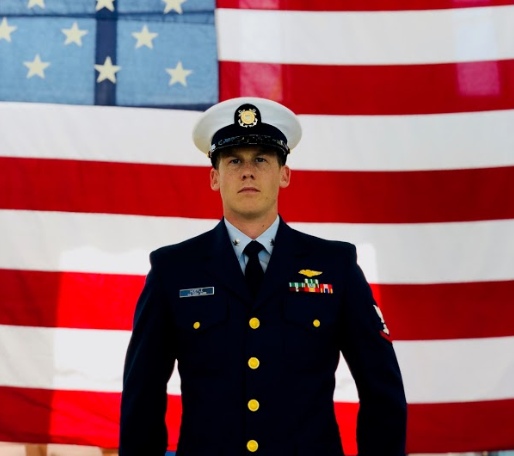 On October 19, 2017 AST3 Hoefle was responsible for saving the life of a critically injured mariner while serving as the duty rescue swimmer on board a Coast Guard helicopter. In the early morning hours, AST3 Hoefle and his crew launched to render assistance to a commercial fishing vessel following a catastrophic equipment failure that instantly killed one crew member and severely injured another. AST3 Hoefle helped develop a rescue plan and recommended a deployment to the water as a safer course of action. AST3 Hoefle was hoisted down into the water and swam through the darkness and heavy seas, eventually pulling himself up 8 feet over the vessel's freeboard. AST3 Hoefle quickly assessed the situation and began to triage the severely injured crew member. AST3 Hoefle suspected possible spinal injuries and created a makeshift cervical collar and other splits to immobilize the patient as best as possible, stabilizing the patient during the nearly two hours it took for the helicopter to arrive back on scene. AST3 Hoefle demonstrated superior strength and thought throughout the mission, saving the patients life. ASYMCA is pleased to honor Angel of the Battlefield award recipient Aviation Survival Technician Third Class (AST3) Richard C. Hoefle.